First name(s)/Initials: E. P. J. Additional info: Born 17.3.1927. Attested in July/August 1945. Sent to England in late October 1945, as one of the first Danes to arrive there. He qualified as a military parachutist on Course 195 which ran at RAF Upper Heyford from 1.7.1946 to 25.7.1946 - "Excellent performer, steady and reliable"
T.A.R.A. 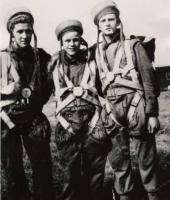 Course (Tack-Ack) held at 33rd Airborne Light Regiment R.A. Passed T.A.R.A. Gr. 'E' Class III: 16.7.1947. 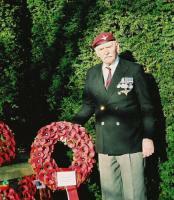 He arrived in Quetta, India 15th November 1946 and joined 159th Parachute Light regiment R.A. 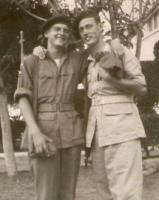 In 1947 the regiment went to Egypt. Shortly thereafter, the unit changed its name to 87th Airborne Field Regiment and was posted to Pardes Hannah and then Benyamina, Palestine. Erik was on HMT Runnymede Park during the Exodus 1947 incident. Photo #2 - Vedsegaard on the left. Photo #3 - Vedsegaard on the right.